Following four interest rate rises in 2018, the Fed was on course for more in 2019. After the January meeting, not only does it look like monetary tightening has stopped, but Chair Jerome Powell even gave the strongest hint yet that the extraordinary monetary policies have become ordinary. The size of the Fed’s balance sheet will be driven mainly by the banks’ demand for reserves, which the central bank knows to be “far larger” after the financial crisis than before, Powell said during a news conference after the FOMC decision was announced. “Higher reserve holdings are an important part of the stronger liquidity position that financial institutions must now hold,” he said. Buried in the Fed Chair’s speech, this paragraph didn’t impress many observers. But what it says in fact, is that the Fed is afraid that if it tightens further, it could cause a chain reaction in which defaults on debt accelerate and this ultimately feeds through to the financial system. The post-financial crisis monetary largesse has encouraged a build-up of debt; conditions for corporate debt have become more and more permissive. But because probabilities of default are to some extent based on past data, and during the low rate environment defaults were few, it is likely that the current models underestimate this risk. In the words of Tobias Adrian, financial counsellor and director of the International Monetary Fund’s Monetary and Capital Markets Department, bond market participants may be underpricing credit risk. “Easier financial conditions lead to lower default forecasts in these models, causing investors to tolerate higher credit risk. That’s when credit problems tend to build up in markets,” Adrian said in a recent speech. 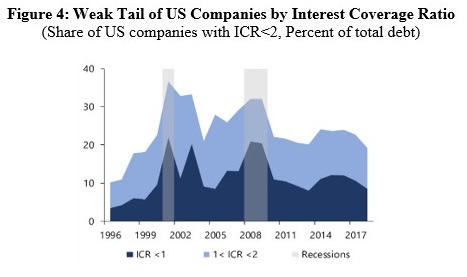 While the share of companies with weak interest rate coverage ratios is not as high as it was before the previous two recessions, it certainly is not as low as it was before. The rather bad quality of the debt that is out there is the real reason behind the Fed’s U-turn. While the chart above only shows the debt in the US, the situation is the same or maybe even worse in Europe and elsewhere. The quality of debt has worsened progressively as monetary conditions have been relaxed. All this is not new, of course. Investors have known about these issues, which can be succinctly described in few words – the consequences of moral hazard – for years. But they had been soothed by the Fed’s always benevolent stance. The market rout that we saw in 2018 showed that investors had begun to wake up to the risks of a return to normality by the Fed. Powell was a bit slow to realise this, but once he did, he was quick to pull a veiled Mario Draghi-style speech out of his sleeve. To sum up: Whatever it takes.